The National Flood Insurance Program (NFIP) minimum elevation requirements, to point out common construction practices that are violations of NFIP regulations and result in significantly higher flood insurance premiums, and to discuss the NFIP Elevation Certificate. Why Is the Lowest Floor Elevation Important? In inland areas, experience has shown that flood has damage the areas of buildings that are not elevated above the flood level and it destroyed the contents of those areas. In coastal areas, wave action causes even more damage, often destroying enclosed building areas below the flood level. Once waves rise above the lowest structural member in a V zone or coastal A zone, the elevated portion of the building is likely to be severely damaged or destroyed. 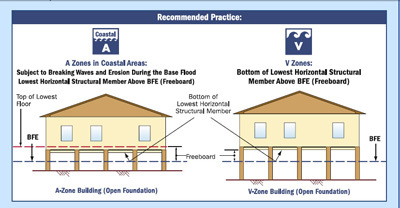 It is recommended that the bottom of the lowest horizontal structural member of Vzone buildings be elevated 1 foot or more above the Base Flood Elevation (BFE). NFIP minimum elevation requirements: A zone – elevate top of lowest floor to or above BFE; V zone – elevate bottom of lowest horizontal structural member to or above BFE. In both V and A zones, many people have decided to elevate a full story for below-building parking, far exceeding the elevation requirement. What Does FEMA Consider the Lowest Floor? The lowest floor of the lowest enclosed area, except for unfinished or flood-resistant enclosures used solely for parking of vehicles, building access, or storage. If the lowest enclosed area is used for anything other than parking of vehicles, building access, or storage, the floor of that area is considered the lowest floor. 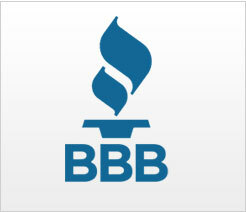 This will violate NFIP requirements and drastically increase flood insurance premiums. The floor of a basement will always be the lowest floor, regardless of how the space is used. Walls of enclosed areas below the BFE must meet special requirements in coastal areas. Setting the lowest floor at the correct elevation is critical. Failure to do so can result in a building being constructed below the BFE. As a result, work can be stopped, certificates of occupancy can be withheld, and correcting the problem can be expensive and time-consuming. After piles have been installed, the intended elevation of the lowest floor should be checked before the piles are cut off. After the lowest horizontal structural supporting members have been installed, the elevation should be checked again, before any further vertical construction is carried out. Most communities require permit applicants to retain a surveyor, engineer, or architect to complete and submit the elevation certificate. Multiple elevation certificates may need to be submitted for the same building: a certificate may be required when the lowest floor level is set; a certificate will be required upon completion of all construction.